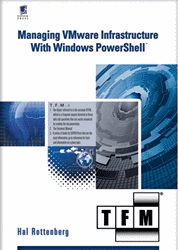 Just a short note to all you VI Toolkit / PowerCLI users out there that Hal Rottenberg’s book, Managing VMware Infrastructure with Windows PowerShell is now shipping, order your copy today! Hal’s book is full of great tips, tricks and useful samples that will help you learn and use PowerCLI to manage and automate your virtual infrastructure. In fact you can download all those samples right now over at the publisher’s website. And also, congratulations to Hal, all the hard work has finally paid off! I pre-ordered about a month ago so hopefully I should be getting is soon. I can’t wait to go through it. Congrats Hal.